Consumer sentiment for retail banking appears to be improving over last year, and Navy Federal Credit Union and USAA Federal Savings Bank are America’s favorite financial institutions, according to a new study by Market Force Information® (Market Force). More than 7,400 banking customers were polled for the study, which also provides insights into banking trends and technology adoption. Navy Federal and USAA tied for the No. 1 spot as consumers’ favorites among the banking institutions studied. They each earned an 81% score on Market Force’s Composite Loyalty Index, which represents an average of how satisfied consumers were with their last banking experience and how likely they are to recommend the bank to others. Regions Bank climbed 14 percentage points from last year to land in a distant second place with 61%, while Chase edged out Capital One – last year’s highest ranked large traditional retail bank – for the third spot. Wells Fargo landed at the bottom of the rankings for the second straight year with 39%. [See Graph 1]. Across the board, study participants gave their banks higher scores in 2018 compared to 2017. When asked to rate how satisfied they are with their primary bank relationship, 57% indicated they are very satisfied, an 8 percentage point increase over 2017. Banking customers are also more inclined to recommend their primary bank to friends or colleagues – 60% are very likely to do so, compared to 54% who said the same last year. When asked how their primary bank performs on a long list of measures, consumers gave more positive responses on every measure this year. For example, 48% said their primary bank has their complete trust, up from 41% in 2017, and 56% said their bank resolves issues efficiently, compared to 47% in 2017. However, while satisfaction is increasing, there is still ample room for banks to improve when it comes to showing interest in their customers’ financial wellbeing and understanding their needs. [See Graph 2]. Market Force’s research identified six key measures that, when executed in combination, impact a bank’s ability to delight customers. They include: 1) Understanding a customers’ unique needs, 2) Having their complete trust, 3) Resolving Issues efficiently, 4) Making frequent transactions easy, 5) Having an excellent reputation and 6) Charging fair fees. On those six attributes, USAA and Navy Federal dominated the rankings, taking the first and second spots for each category. Regions Bank also scored consistently well across the board. Conversely, Wells Fargo and Bank of America landed at or near the bottom for every measure. [See Graph 3]. 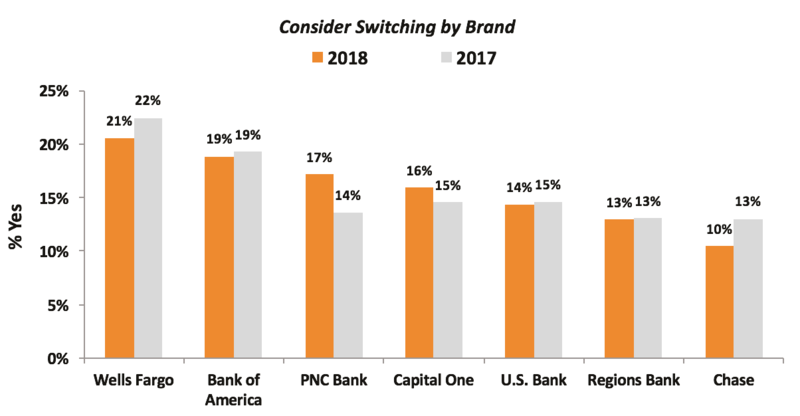 While sentiment may be increasing, 13% of study participants are considering switching to a different primary bank in the next six months. This is a slight decrease from the 14% who said as much in 2017, and a slight increase from the 12% in 2016. Wells Fargo customers topped the list of those considering a change, followed by Bank of America and PNC Bank. [See Graph 4]. Increasingly, consumers are downloading their primary bank’s mobile app and nearly everyone surveyed is regularly using it. Eighty-three percent have downloaded the app, compared to 79% in 2017, and a sizeable 94% report having used it in the past 90 days. The top reasons consumers cited for not yet downloading their primary bank’s mobile app include a preference for using the bank’s website from a computer and concerns about security. Primarily, bank apps are being used to check account balances, check statement or payment history and make deposits. The least used functions include checking credit scores, ordering checks, replacing credit or debit cards and opening new accounts. Use of digital wallets or e-wallets is also increasing, with 33% indicating they use one, compared to 23% in 2017 and 14% in 2016. PayPal is the most popular e-wallet – 69% use it, followed by Apple Pay with 42% and Venmo with 28%. The most common uses for e-wallets include making payments, sending money and receiving money. For the favorite bank rankings, Market Force asked participants to rate their satisfaction with their last experience at their primary banking establishment, and their likelihood to recommend it to others. 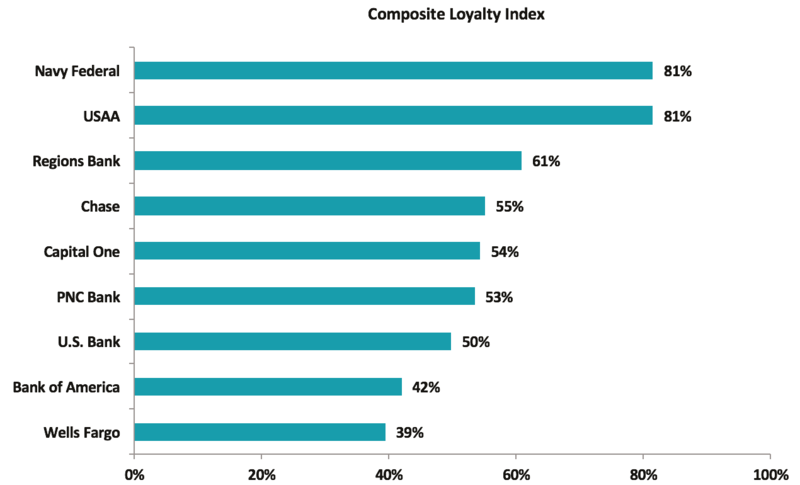 That data was averaged to rate each brand on an aggregation of the two measures – a Composite Loyalty Index. Only brands that received 100 or more reviews were included in the rankings. The survey was conducted online in September 2018 across the United States. The pool of 7,415 banking customers represented a cross-section of the four Census regions and reflected a broad spectrum of income levels, with 52% reporting household incomes of more than $50,000 a year. Respondents’ ages ranged from 18 to over 65. Approximately 72% were female, 27% were male and 1% preferred not to answer. Market Force Information® is a customer experience (CX) management company that provides location-level measurement solutions that help businesses protect their brand reputation, delight customers and make more money. Solutions include customer experience surveys, employee engagement surveys, mystery shopping, contact center services and social media review tracking, which are integrated into one technology and analytics platform, KnowledgeForce®. Founded in 2005, Market Force has a growing global presence, with offices in the United States, Canada, United Kingdom, France and Spain. It serves more than 200 clients that operate multi-location businesses, including restaurants, major retailers, grocery and drug stores, petro/convenience stores, banking & financial institutions and entertainment brands. The company has been recognized as one of the top 50 market research organizations in the AMA Gold Report. For more information about Market Force, please visit us online at http://www.marketforce.com.